A large bearing block *daito 大斗 with a bracket arm *hijiki 肘木 inserted into it. It is the most fundamental combination used as a bracket complex *tokyou 斗きょう and is set parallel to the wall plane to carry a beam *keta 桁. 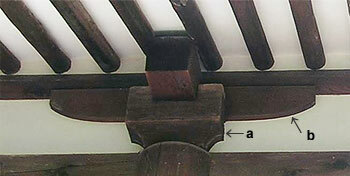 This simple bracket complex was used in Buddhist temple buildings originally considered to be of low rank. Two examples now classed as national treasures are Houryuuji Denpoudou 法隆寺伝法堂 (early 8c), and Shin'yakushiji Hondou 新薬師寺本堂 (8c), both in Nara.